(CBS News) -- With millions of dollars in campaign debt and just two Republican primary victories under his belt, former House Speaker Newt Gingrich finally called it quits Wednesday, suspending his campaign for the presidency so he could go back to being an "active citizen." "Today I am suspending the campaign, but suspending the campaign does not mean suspending citizenship," Gingrich said in lengthy remarks to a bank of television cameras. Gingrich told reporters last week he would make his departure official this week. 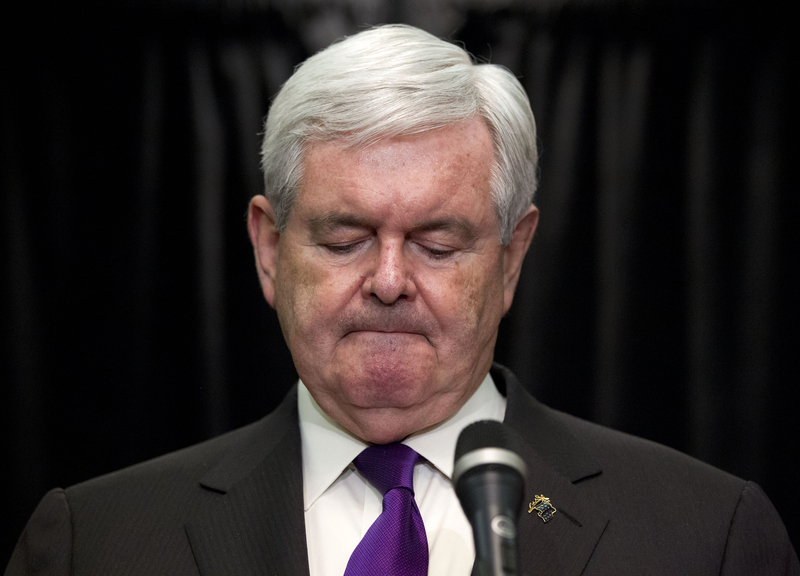 Gingrich deemed the campaign "a truly wild ride" during the appearance in Arlington, Virginia, saying, "I could never have predicted either the low points or the high points." Quoting an observer who suggested that his best days may be ahead, Gingrich vowed to focus on balancing the budget, advocating for "religious liberty" and social security savings accounts and working for American energy independence. He also said he would work to "reemphasize the work ethic" in America, advocate for his national security positions and press for increased brain research. Gingrich also stood behind his campaign push for a moon colony, though he acknowledged that it was "probably not my most clever comment in this campaign." He said that despite having providing fodder for "Saturday Night Live" by pushing for the moon colony, he believed that the proposal was sound, arguing that Americans should seek to "go out and pursue great adventure." Throughout the campaign, Gingrich complained bitterly that Mitt Romney and the super PAC backing Romney were using their massive fundraising advantage to essentially buy the election. It was one of many harsh criticismsGingrich made of the presumptive GOP nominee. Gingrich called Romney a liar adept only at "managing the decay" who "looted companies" during his business career, "leaving behind broken families and broken neighborhoods." Gingrich, who said during the campaign that Romney was not a true conservative, said Wednesday that Romney should be considered conservative in comparison to President Obama. "This is not a choice between Mitt Romney and Ronald Reagan, this is a choice between Mitt Romney and the most radical leftist president in American history," he said. Gingrich pointed to the judges that would be appointed by each candidate in arguing -- relatively tepidly -- for his former bitter rival. Gingrich did not endorse Romney on Wednesday, but his spokesman, R.C. Hammond, said he planned to do so at a joint appearance with Romney in the future. In a statement, Romney said Gingrich "has brought creativity and intellectual vitality to American political life." "During the course of this campaign, Newt demonstrated both eloquence and fearlessness in advancing conservative ideas," he said. "Although he long ago created an enduring place for himself in American history, I am confident that he will continue to make important contributions to our party and to the life of the nation. Ann and I are proud to call Newt and Callista friends and we look forward to working with them in the months and years ahead as we fight to restore America's promise." Gingrich's criticisms of Romney are already finding their way into attack ads from the Obama campaign, which put out a video Wednesday morningfeaturing a number of the former House speaker's attacks on Romney. On Tuesday, the Obama campaign released a television ad that followed Gingrich in spotlighting Romney's "Swiss bank account." Gingrich stumbled out of the gate in his presidential run last May, taking heat from many in his party for deeming Paul Ryan's controversial House budget "right-wing social engineering." In June, his staffers resigned en masse, complaining of a lack of direction and seriousness on the part of the candidate. But driven by a string of strong debate performances featuring attacks on the media, Gingrich rose to the top of the polls in November. After again being written off following disappointing finishes in the early states, he scored a convincing January 21 victory in South Carolina, a state that has traditionally picked GOP nominees. It was the first of Gingrich's two victories, the other coming in his home state of Georgia. Gingrich then faltered in the debates after South Carolina, however, and Romney beat him soundly in Florida on January 31. Gingrich was unable to recapture his momentum following that loss, and many in the GOP feel he stayed in the race far longer than he should have, potentially damaging his brand and earning power. In addition to his campaign activities and issue advocacy, he is expected to go back to writing books, giving paid speeches and possibly rebuild his consulting businesses in the coming months. By suspending his campaign, Gingrich can continue to raise money to pay down the millions of dollars he has accrued in campaign debt. The former House speaker has indicated that Romney has agreed to help him retire the debt.